Welcome to BeachPoint Cottages on Siesta! You've arrived at the best vacation location on Siesta Key. Our tropical beach cottages are perfectly set just a few steps from the warm turquoise waters of the gulf and our pure white sand. And guests say our beach location is in the most desirable area on the key. No traffic, no searching for a parking space, no crowds...just a flip-flop walk about 100 yards from your door to the beach! Siesta Village is a 3 minute walk from your cottage. Enjoy the most amazing sunset viewing location on the key, then take a leisurely stroll to the village for entertainment and food. BeachPoint offers the perfect Florida beach destination, with numerous free amenities. And selected cottages are dog friendly! We have 9 eclectic suites available - from a cozy studio to house sized rentals. Enter your vacation dates and the number in your party to see the total cost for each available cottage. Select a cottage and click to request a reservation. How far is the beach? Less than 100′ from our front door! Can I walk to Siesta Village? Yes, in less than 5 minutes! Do I need a car? What is Siesta Key like? How’s the weather at Siesta Beach? See answers to these and other frequently asked questions about Siesta Key, Florida. Our amenities are included in the quoted rate so you can plan your beach vacation knowing there are no extra “resort fees”. Fill a complimentary beach cart with chairs, umbrellas, a cooler and more. We provide bikes, free wifi and more. We strive to ensure that everything you’ll need is included. BeachPoint Cottages is budget friendly. 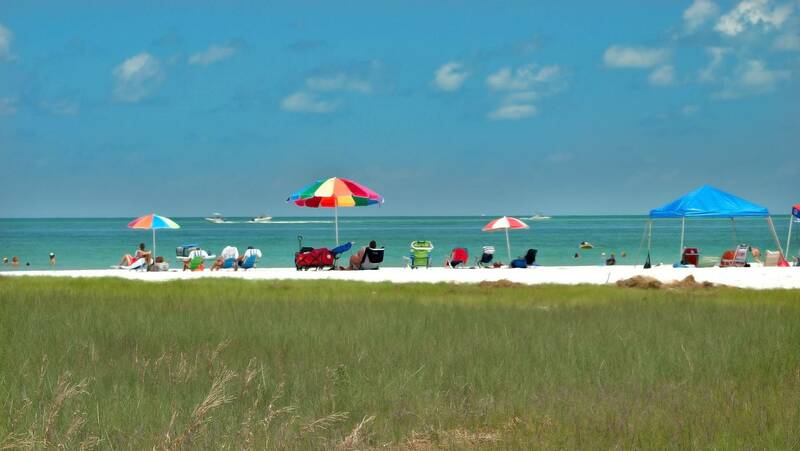 BeachPoint Cottages sits on a prime Siesta location in 3.5 square miles of paradise in the Gulf of Mexico. 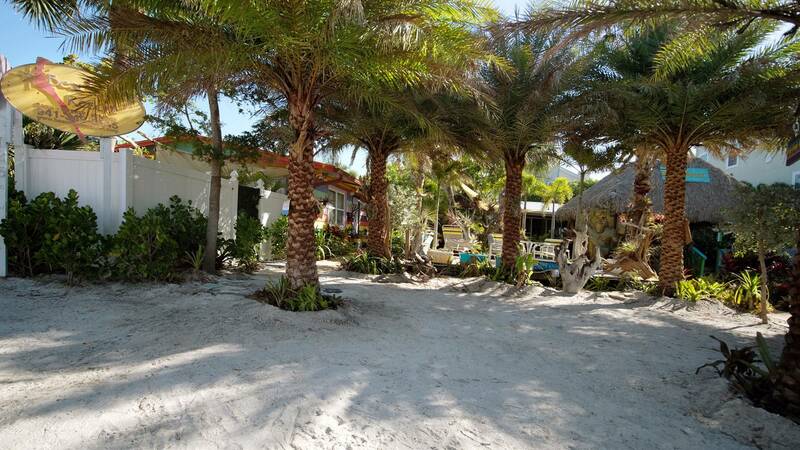 We are one of the only vacation rental properties with direct access to a very unique and quiet area of the beach. This special location is accessible primarily by foot or bike. So parking is never an issue! Our property is a quiet hidden gem tucked between beautiful Siesta Beach and Siesta Key Village. 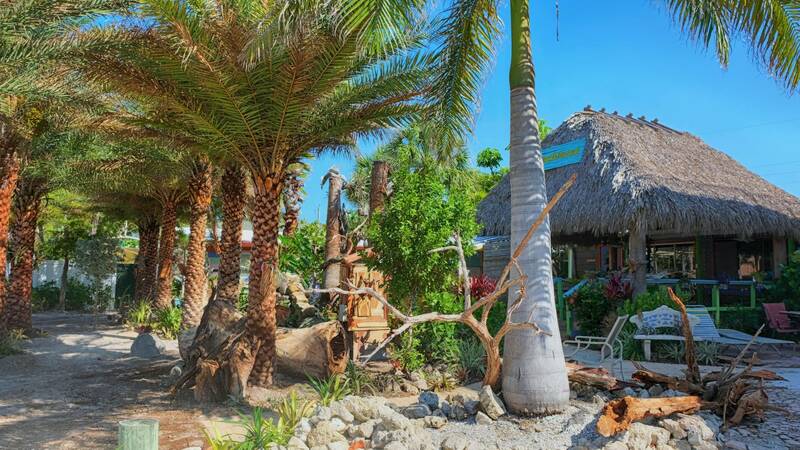 Relax… At BeachPoint, you’re surrounded with lush vegetation, quirky decor and a laid back ambiance. Plus you have flip flop access to a quiet part of the beach in your front yard. Are you ready for your day at the beach? Our part of the beach is quiet. It feels private. No crowded parking lots, no waiting for parking…you’re just a barefoot walk across a dead-end street to our beautiful beach that is consistently named one of the top beaches in the world. BeachPoint Cottages – this is a place you can relax.